Holy mouthful of a name Batman! One of the hardest part of creating your own recipes is naming the recipe! My boyfriend, Michael, keeps calling this goodness “Tomato Potato” but somehow I just felt like that wasn’t really doing the meal justice. What we have here is a one pot (i.e. less mess and cleanup) sweet potato (yummo! ), tomato (ties the whole meal together), and kale (my favorite, as you already know) rice skillet (and now we’ve got a full meal). Oh and there’s some chickpeas in there for good measure. So while this recipe may be a mouthful, it’s a mouthful I am extremely happy to take a bite of any day! With the holidays upon us, I always have a hard time with getting meals on the table. I want something quick and easy to make that won’t zap the remaining energy I do have between all the holiday get togethers, running around doing last minute errands and everything else that comes with the holidays. That’s where one pot meals come in. Basically with a one pot meal, you can cook the whole meal from start to finish in the same pot and ideally within 30-45 minutes. One of the best ways to do that is by using canned vegetables and beans. It’s a time saver and really makes one pot meals come together in a cinch. More often than not, I use canned tomatoes, like Hunt’s diced tomatoes, in my recipes because it’s a lot quicker than cutting up fresh tomatoes and I know that I always have a can in my pantry for quick and easy meals. I love pairing Hunt’s tomatoes with fresh produce like kale and sweet potatoes which makes the whole meal come together. Oh and hey! I got all of my ingredients for this meal at Walmart. Which means all of the ingredients in this meal are super easy to find and I bet you even have most of them in your kitchen right now! I absolutely love the way this one pot sweet potato, tomato and kale rice skillet (still a mouthful) turned out! By cooking the rice in the skillet, you have dinner on the table in less than 45 minutes and it’s super delicious. When you have a last minute minute dinner guest that has dietary restrictions or preferences this is your new go-to because it’s gluten-free, dairy-free and even vegan. If you do want to add meat, tofu, or cheese to this meal for a little extra somethin’ somethin’ by all means go ahead! I would brown the meat first before starting with the sweet potatoes. If you’re adding cheese, I would add it at the end and put the lid back on until the cheese is all melty and delicious. My favorite part about this meal (besides the one pot meal status of course) is the seasoning. The skillet is gloriously seasoned with cumin, which I’m not sure if you have ever tried curried sweet potatoes, but if you haven’t you totally need to. The smell alone of the cumin cooking with the sweet potatoes had me in absolute heaven. And then when I tried a bite… oh my goodness! Seriously sooo good! 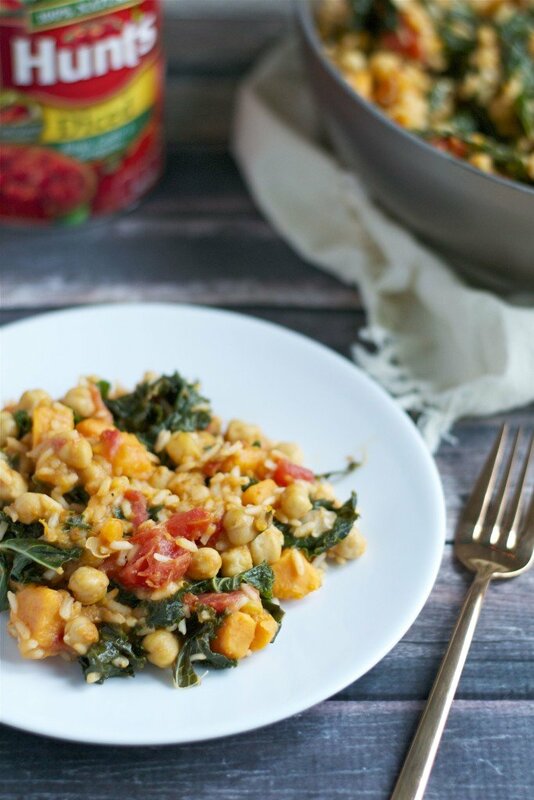 This one pot sweet potato, tomato and kale rice skillet makes dinner a breeze! Everything goes in just one pot and dinner is served in under an hour! Gluten-free, dairy-free and vegan. In a large skillet, preheat oil over medium heat. Add the sweet potatoes and cumin. Cook for 4-5 minutes, until sweet potatoes are seared on all sides. Add chopped kale to the pot and stir until it is wilted. Then add in diced tomatoes and chickpeas and stir until combined. Then, add the uncooked rice. Pour the broth over the skillet and stir until completely combined. Add salt and pepper to taste. Bring to a boil. Once boiling, cover pan with a lid and bring to a simmer. Cook for 20-25 minutes, until rice is fluffy and the chicken broth is mostly absorbed. You may need to stir one or two times throughout the cooking so that the rice doesn't stick to the bottom of the pot. O yum!!! So easy and such a great way to play up some white rice!! Love it! Could you possibly put this after the boil into a crockpot and simmer it there… ? So I haven’t tried it in a slow cooker since I like this as a quick meal but I think you could actually throw everything in the crockpot without even using the stove(except the kale). You could even use wild rice or brown rice then if you wanted because they take longer to cook. I would throw the kale in at the end and stir it in until it wilts and then cook for maybe 5-10 minutes more in the crockpot before serving. Only thing is you might want to add in some additional veggie or chicken broth depending on how the rice is looking. If it’s starting to look dry in there but the rice isn’t cooked then add some more broth. Let me know how it goes! ? Sorry! I don’t list calories for now on my blog. There are just too many variables that can affect the range of calories. And I myself don’t watch calories as I tend to just focus on eating whole foods as much as possible and listening to what my body needs. Do you think this would keep in the fridge or freezer for any amount of time? Thanks Kelsey! I love your additions! I’m going to have to try that next time! I thought this was delicious, will definitely be put into my roatation. Hi! Would it work if I used spinach instead of kale? It’s all I have on hand! Hi Nicole, Yes! Spinach will work great! Hi! Love the recipe. Just wanted to point out that chicken broth isn’t vegan but you could definitely use vegetable broth in its place! If you use brown rice be sure to use 4.5 cups of broth and increase the cooking time by almost double. This recipe is delicious and easy so I highly recommend it! How big is a serving size? Thanks!! !